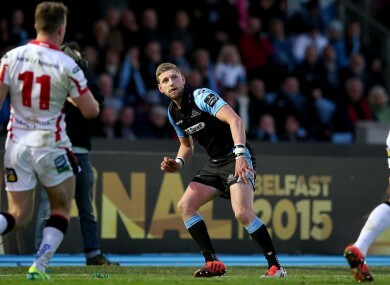 Finn Russell’s nerveless late conversion sent Glasgow into a second consecutive final. Russell watches his kick sail over. GLASGOW DENIED ULSTER a home Pro12 final in the most dramatic of fashions as they scored a late try overturn a five-point lead for the visitors. Having led most of the way, Ulster were undone by a period of intense pressure from table-toppers and replacement DTH van der Merwe raced beyond Craig Gilroy to dot down in the corner to set up the deciding kick for Finn Russell. On a day when nothing came easily with scrum dominance swinging from side to side and every single breakdown contested as if it were the last, the try that edged Ulster in to a dominant position came remarkably fluidly at a time when they trailed 6 -3. The Irish side poured in to gaps thanks to Paddy Jackson’s soft hands throughout the first half and when forwards like Callum Black and Dan Tuohy joined the party they were in full flight. Jackson sent Henderson galloping towards the 22 and the big back row was able to pull up anticipating contact and fed Gilroy who delayed tacklers further. Ruan Pienaar capitalised on the quick ball and stretched defence with a long looping pass left, where Chris Henry was only too happy to find himself in space to finish off the three on two. Pienaar could not convert the resulting conversion, but kicking was about all that was off colour in a pulsating contest between two teams who demand success to reward a period of change on and off the field. Glasgow began to dominate the scrum before half-time, winning a crucial penalty when Ulster were camped on the five metre line. The northern province had to settle for a 6 – 8 lead at the break and after it, they went in to containment mode, shutting Glasgow down and attempting to force errors rather than rolling the dice to kill the game. Pienaar landed a 55th minute penalty to open up a five-point lead. And despite some tension-filled moments when Niko Matawalu tangled with Craig Gilroy when chasing his own kick beyond the try-line, the Springbok was able to do it again minutes later. Russell’s straightforward penalty cancelled out by a humongous 55 metre drive from Pienaar’s right boot. The job is far from done when your lead is just five points away from home, however. Gregor Townsend’s side are too good to go down without a fight and they duly roared back in the final 10 minutes, putting phase after phase together. Ulster defended doggedly, but ultimately the classy skills – far from the description for his efforts at winning penalties from referee George Clancy – of Niko Matawalu undid Ulster. From that moment on the left, Glasgow streamed right and a beautiful looping pass from Russell found van der Merwe. The scores level, there was still more needed from Russell. And he stepped up purposefully and unleashed the perfect kick, bisecting the posts and leaving Ulster to clutch at straws in the remaining minutes. Penalties: F Russell (2), S Hogg. Email “Stormer of a semi-final ends in heartbreak for Ulster”. Feedback on “Stormer of a semi-final ends in heartbreak for Ulster”.